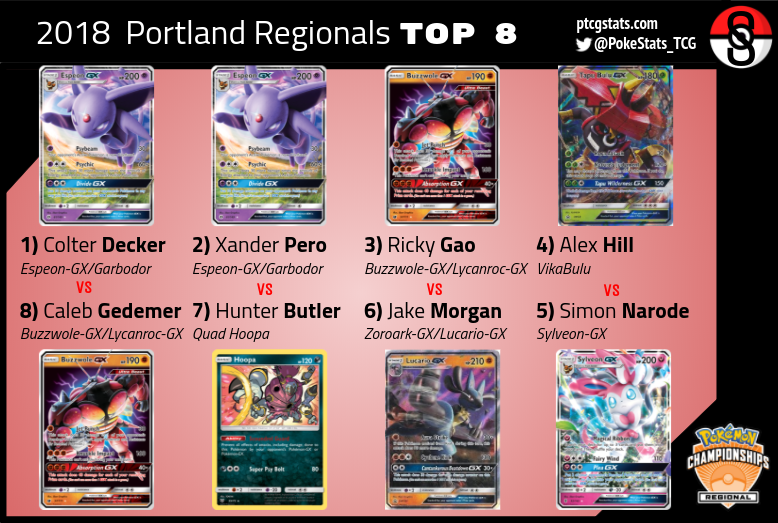 Portland Regionals are this weekend in Oregon, USA. The tournament is Standard format, BRT-UPR. Lucario-GX is legal for the first time. Be sure to check out our Twitter coverage as well. 4:39 PM - We misreported Caleb Gedemer's deck as Garchomp/Lucario/Lucario-GX/Lycanroc-GX. It is actually Buzzwole-GX/Lycanroc-GX. Apologies for the confusion. 9:36 PM EST - Xander Soriano (deck unknown) and Daniel Altavilla guarantee Day 2 appearances, advancing to 7-0-0! 7:33 PM EST - Liam Williams advances to 5-1-0, securing his 2018 Worlds Invite! 5-1, don't have to play in any more league cups!! 7:18 PM EST - The Kica/Altavilla incident was resolved by giving Kica a game loss; a judge was seated at the table at the start of game 2. Many top players are playing Sylveon-GX, Lucario-GX variants, and VikaBulu.